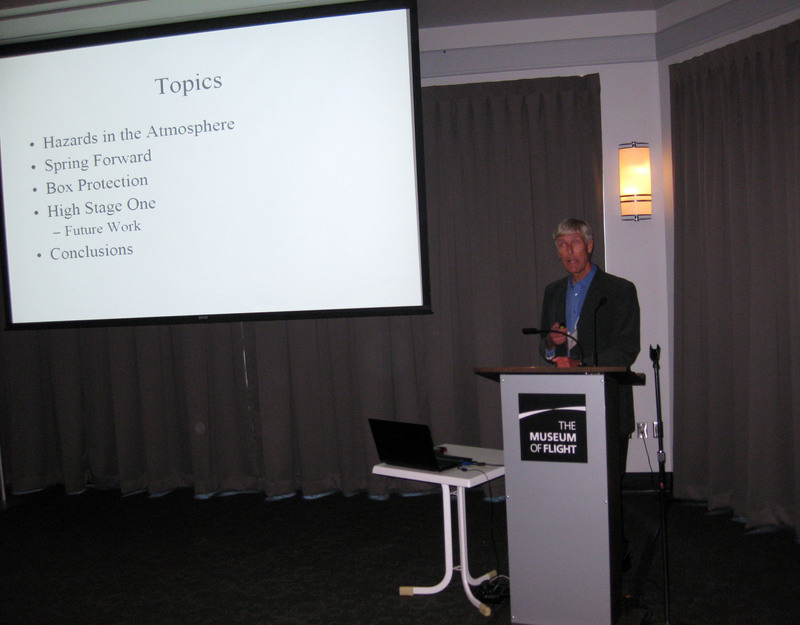 Dr. John Knapman give a presentation on how we deal with the Tether and the Climber within earth’s atmosphere. Even though the distance of this portion of the trip is tiny compared to the total trip (~50km vs 100,000km), there are many “special” hazards which must be dealt with. This consists of weather; wind, rain and lightning. John discussed “Spring Forward” (winding up the tether at the ground, stretching the tether, attaching the Climber and then letting the tether “spring” back into its original shape), “Boxed Climber” (having the Climber packaged in a protective box for its journey through the atmosphere) and High Stage One (a structure built to have the elevator base station be above the atmosphere and thus bypass these problems altogether). This entry was posted in Interviews / Presentations, ISEC on August 22, 2014 by Ted Semon. 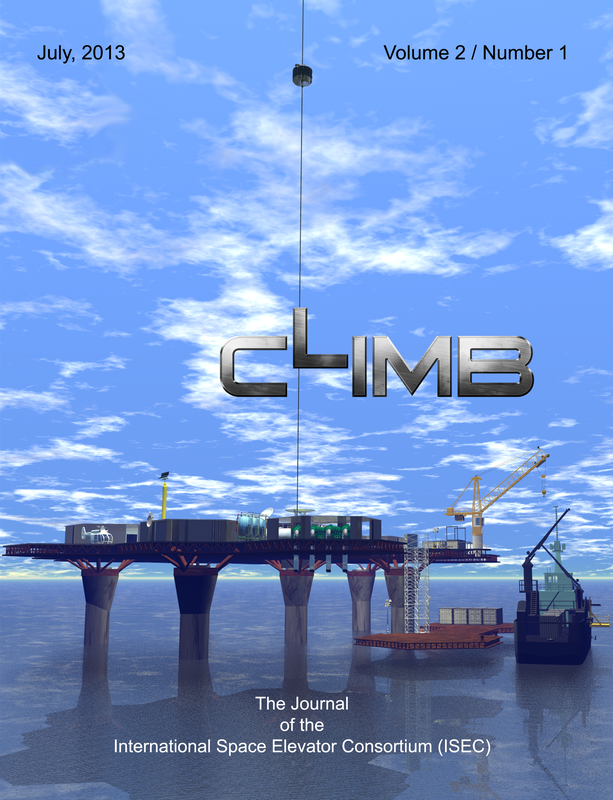 The International Space Elevator Consortium (ISEC) has issued its official Call for Papers for Volume 3 of CLIMB, the Space Elevator Journal. Volumes 1 and 2 of CLIMB were published in 2011 and 2013, respectively, and ISEC is targeting August of this year for the publication of Volume 3. You can find the official Call for Papers document here, giving details as to the subject matter desired and the submission / publication process and schedule here. Abstracts are required first and should be accepted before Papers are submitted (details are in the Call for papers announcement). For the most up-to-date information, please visit the CLIMB page on the ISEC website. Questions can be emailed to climb [at] isec.org. Volume 1 of CLIMB was the “Yuri Artsutanov” edition while Volume 2 of CLIMB was the “Jerome Pearson edition”. Volume 3 will be dedicated to the man who almost certainly popularized this concept more than anyone else, Sir Arthur C. Clarke. So come on everyone, let’s get those writer juices flowing! This entry was posted in ISEC, News / Announcements on February 3, 2014 by Ted Semon. The January, 2014 ISEC eNewsletter is hot off the presses and can be accessed here. 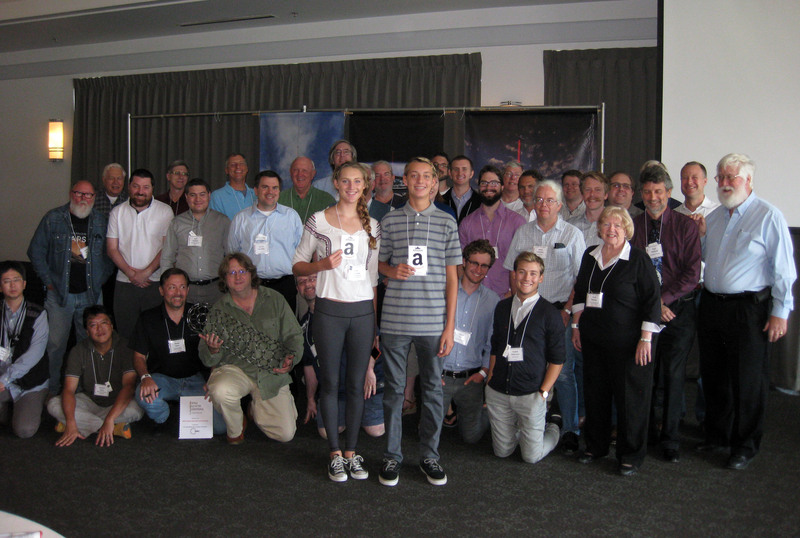 Lots of good stuff this month, including the Call for Papers for the 2014 edition of CLIMB (The Space Elevator Journal), the 2014 ISEC membership drive (where you can join/renew an ISEC membership for reduced rates) and a report on the recently concluded IAA Space Agency Heads of Summit gathering in Washington, D.C. This entry was posted in ISEC, News / Announcements on January 31, 2014 by Ted Semon. 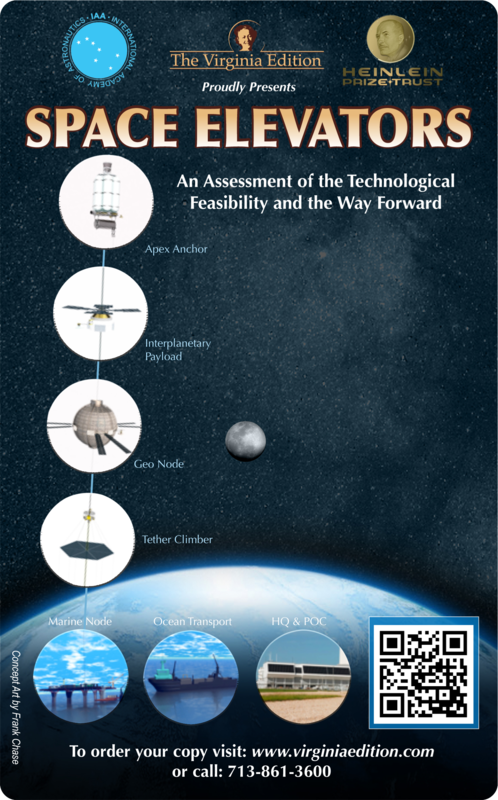 The International Academy of Astronautics just approved this conclusion when it published the study report entitled: “Space Elevators: An Assessment of the Technological Feasibility and the Way Forward.” The report addresses the simple and complex issues that have been identified through the development of space elevator concepts over the last decade. It begins with a summary of ideas in Edwards’ and Westling’s book “The Space Elevator” (2003). Out of these beginnings has risen a worldwide cadre focused upon their areas of expertise as applied to space elevator development and operational infrastructure. The report answers some basic questions about the feasibility of a space elevator infrastructure. A preview of the main questions and answers shows the depth and breadth of this cosmic study. How would all the elements fit together to create a system of systems? What are the technical feasibilities of each major space elevator element? This study benefited from review and comments by numerous members of the Academy, as well as the International Space Elevator Consortium. The study could not have been completed to this level of detail without the timely and invaluable efforts of a diverse collection of experts from around the world who contributed not only their time and knowledge, but also provided material as well as their technical expertise for the study. There were 41 authors and five editors. 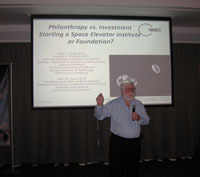 The sponsors of this study report are: International Academy of Astronautics and the Heinlein Foundation Trust. To order a copy visit: www.virginiaedition.com or call (713) 861-3600. The prices are $29.95 for hardcopy and $9.95 for electronic version. As noted in the press release, visit The Virginia Edition to purchase the hardcopy version or Amazon to purchase the Kindle eVersion. This entry was posted in ISEC, News / Announcements on December 14, 2013 by Ted Semon. An initial team has already been formed and an aggressive agenda has been set, but Dr. Swan is looking for someone to head up the effort. The first Conference call of the History Committee is set to occur next Tuesday, November 12th. If you are interested in joining the team and/or heading up the effort, please contact Dr. Swan at pete.swan [at] isec.org. This entry was posted in ISEC, News / Announcements on November 5, 2013 by Ted Semon. 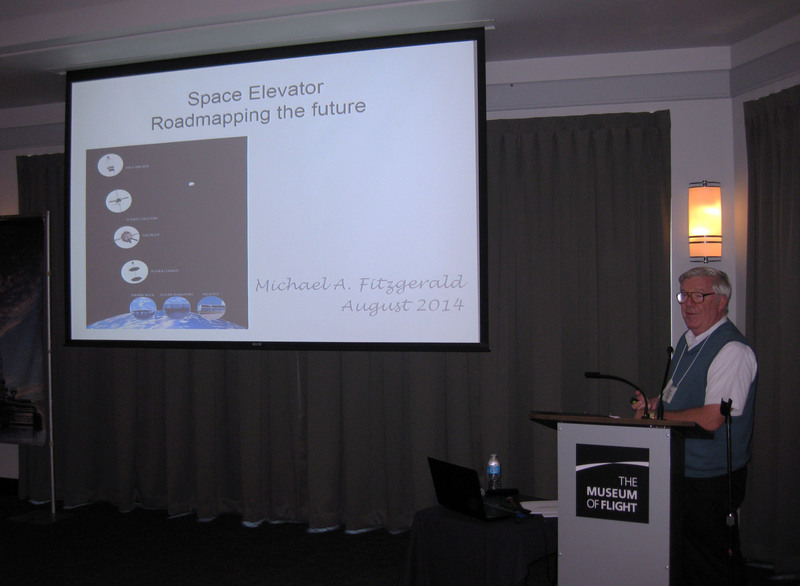 The current month’s email discusses the new “Historian” initiative by ISEC, dates and venue for the 2014 Space Elevator Conference, a summary of the second of the workshops held at the recent Space Elevator conference and more. This entry was posted in ISEC, News / Announcements on October 28, 2013 by Ted Semon. The current month’s email discusses ISEC’s new affiliation with the National Space Society (NSS), reveals the summary of one of the workshops held at the recent Space Elevator conference and more. This entry was posted in ISEC, News / Announcements on September 27, 2013 by Ted Semon. The current month’s email discusses the recent conference, our new slate of Officers and more. You can sign up to be on the ISEC email list here if you want to have the eNewsletters sent directly to you. This entry was posted in ISEC, News / Announcements on August 30, 2013 by Ted Semon. 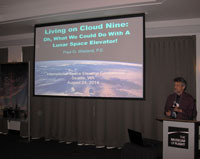 The 2013 Space Elevator Conference wrapped up today with another full schedule. Attendees got one last “fill” of informative and interesting presentations as well as a chance to participate in 2 more workshops. The first activity of the day was an informal polling of the audience as to this question: What would you do with a space elevator? The answers ranged from the serious (colonize the Moon & Mars, send radioactive waste to the sun or to the moon for storage) to the whimsical (bring old cars up the tether and drop them from several kilometers up and then watch them burn up in the atmosphere!). This activity happens at every Conference and it’s always interesting to see what new ideas arise. The exercise does serve a serious purpose, helping to identify potential customers for a functioning Space Elevator. The first presentation of the day was Electric Currents on the Space Elevator and was given by Dennis Wright. 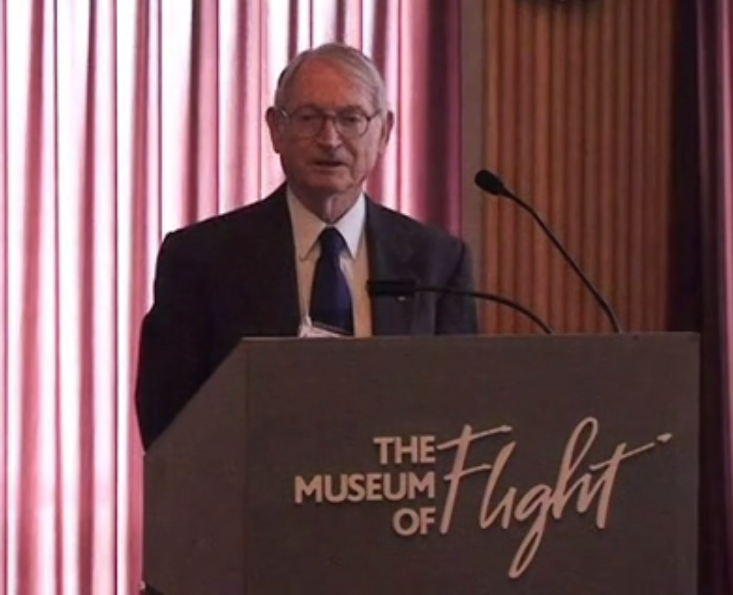 He addressed one of the objections that is commonly raised against the space elevator, the concern of electrical currents which might be induced in the Space Elevator by various space-related factors and the fact that a Space Elevator is, in fact, a 100km long object that rotates along with the earth. There are many unknowns about a structure like this, but Mr. Wright took the “knowns”, added some reasonable guesses for the “unknowns”, and came up with some preliminary conclusions. In general, it doesn’t look like these induced currents are much of a problem (big caveat about the unknowns of course), but he did point out a potential electrical danger from broken strands of the elevator. It was a very interesting talk and it’s clear that this type of investigation needs to be ongoing. This talk was followed by multiple “Shotgun Science Sessions”. This is a fixture of Space Elevator conferences now, a series of “5 minute”, “not ready for prime time” presentations where people can stand up and propose practically anything they want. The audience then has a chance to ask questions and, perhaps, shoot the idea down. These sessions ranged from being a Sci-Fi author, to how to dig regolith on the moon, to using a Space Elevator to send radioactive waste to the sun to everything in between. These are lots of fun and have the added benefit of really getting the audience involved. Presenters also know that they can speak without fear of being ridiculed – every idea is treated respectfully (even when it gets shot down!). Following lunch, we then had the final two Workshops of the Conference. 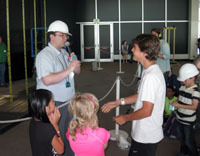 This first was conducted by Dr. Bryan Laubscher and was entitled Balloon Experiments Workshop. Dr. Laubscher wants to set up a competition for school age kids (middle school through College) that would, loosely defined, have teams who build Climbers that ascend/descend tethers that hang from balloons. Teams would be judged on the kind of data they could collect, robustness, and several other suggestions made from the audience. I hope Bryan gets this off the ground (pun intended) – it sounds like a lot of fun! The day wound up with an open conversation between the audience and the Conference organizers as to possible improvement for future events & conferences. There were lots of good ideas presented as to advertising, affiliations and workshops and I’m sure the conference organizers will use this input to make next year’s conference even better. 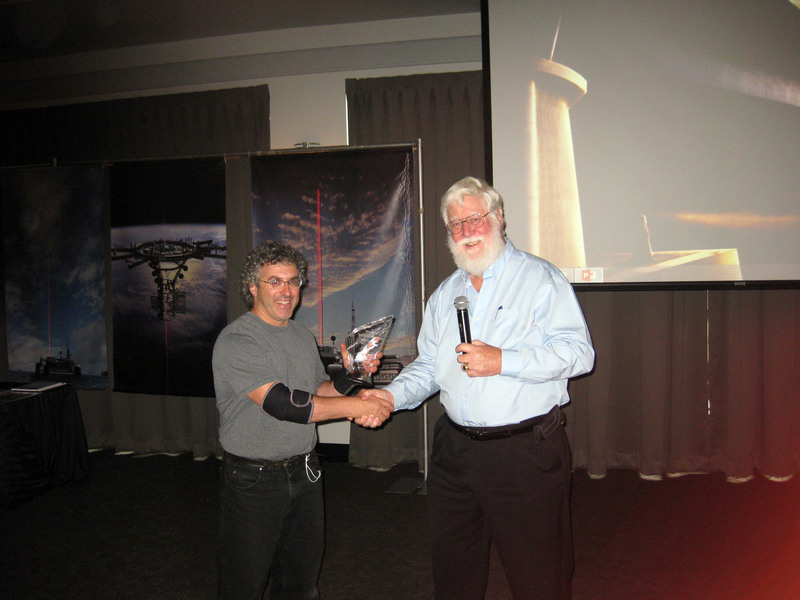 So, the 2013 Space Elevator Conference has come to a close – and it was a wonderful 3 days. Once again I learned a lot, met a lot of interesting and fun people and had my enthusiasm for the Space Elevator project brought to new heights (once again, pun intended). This entry was posted in ISEC, News / Announcements on August 25, 2013 by Ted Semon. Today, Friday – August 23rd, was the first day of this year’s annual Space Elevator Conference, hosted by ISEC. For the second year in a row, it is being held at Seattle’s Museum of Flight, a truly outstanding venue for conferences such as ours. We had a very full first day – several presentations, including a Keynote speech by one of the co-founders of the Space Elevator, American engineer Jerome Pearson, and a Tether-Climber workshop. The day started out with a welcoming speech from the ISEC Conferences Chair David Horn, followed by a Space Elevator System Overview given by Dr. Peter Swan. This was followed by a short ISEC Officers report (more about this in another post). 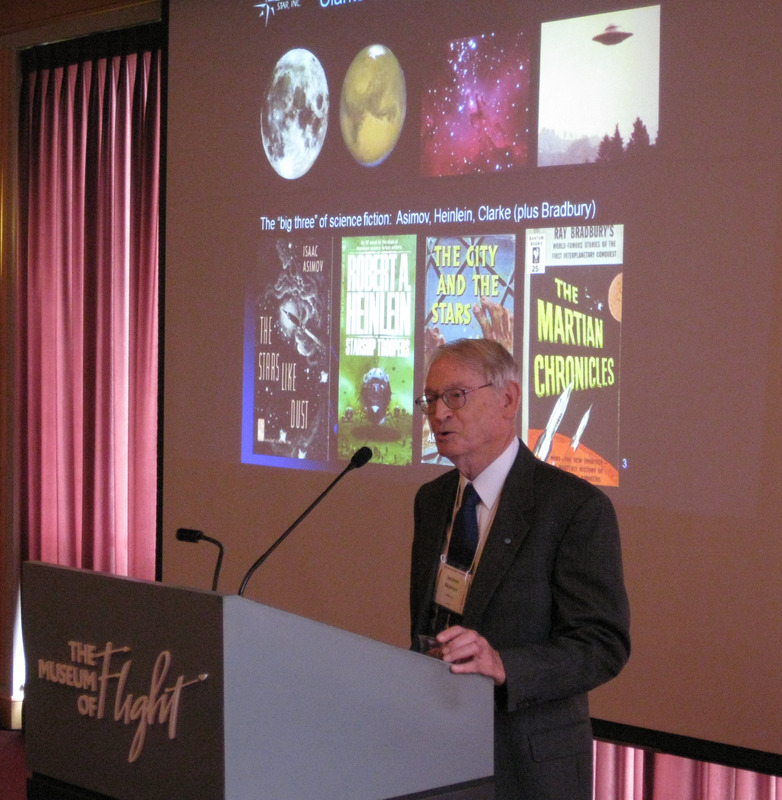 Then Jerome Pearson gave the Keynote address – Sir Arthur Clarke and the Space Elevator. Jerome talked about his long relationship with Sir Arthur, how they met, how they worked together on projects, including Sir Arthur’s brilliant book The Fountains of Paradise and many other related topics. His anecdotes about their relationship and other stories from Sir Arthur’s life were truly interesting. Anyone who is a fan of the Space Elevator and/or Sir Arthur would see this speech as a “must-view”. I video-taped it and, when I get home and can punch up the audio to a respectable level, I’ll post it on the ISEC YouTube channel for all to see. Mr. Pearson has a brilliant and agile mind and it was very enjoyable to get to meet him again. 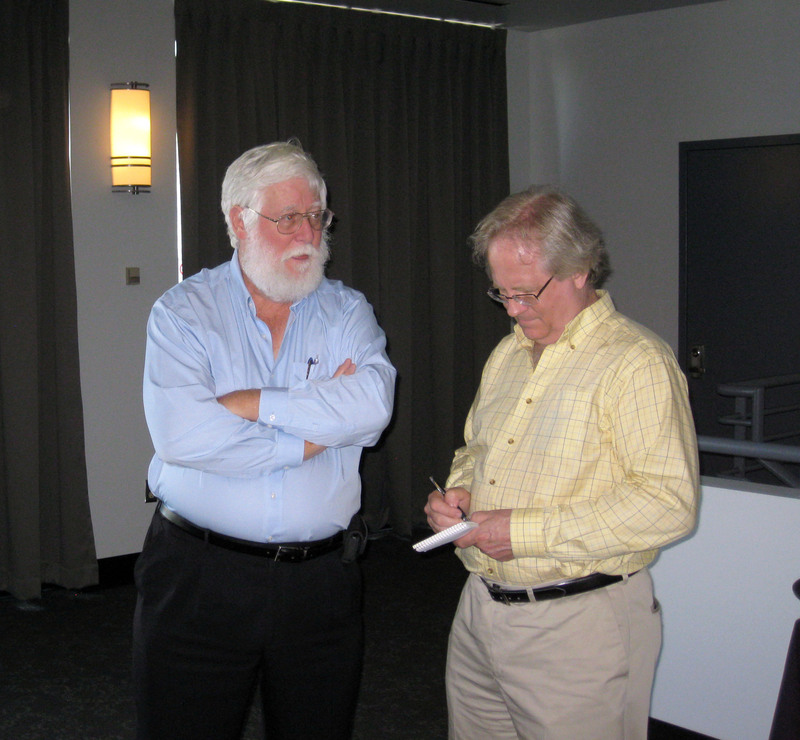 He is currently doing work with NASA (his EDDE project) to help remove Space Debris – a necessary and long-overdue task. After a short break, Dr. Martin Lades gave a remote presentation (he is in Germany where he resides) on Climber-Tether Interfaces for a Space Elevator. I think most people, when they think about the problem at all, just assume that you can equip a Tether-Climber with some sort of pinch-roller mechanism to propel the Climber up/down the tether. Alas, it’s not so simple – the devil is always in the details. The profile of the tether is very small and it is believed that a carbon nanotube-based tether will have a very low friction co-efficient. Solving this with brute-force (i.e. having the rollers pinch the ribbon very tightly) introduce their own problems. 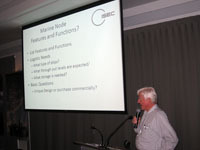 Dr. Lades discussed the various options which might be used to solve this problem. After lunch, Dr. Bryan Laubscher gave a presentation on various methods that might be used in Powering Space Elevator Climbers and the status / likelihood of each. 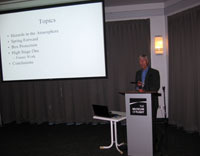 This was followed by Dr. John Knapman’s presentation on the First 40kms Danger and Approach. Both presentations gave the audience an opportunity to further their understanding of how a Space Elevator might actually be constructed and operated. Following these presentations and a break, the first workshop of the Conference then took place, this on Tether Climbers. I gave a short intro and description of a possible “hybrid” climber (using a combination of conventional, laser and solar power) and this was followed by Dr. Knapman presenting the possibility of thinking of how to power climbers in terms of “Constant Power” rather than “Constant Speed” and the tradeoffs that would result. Both of these brief presentations were to get the audience in the mind of thinking about alternatives when it comes to imagining how the Climbers would work. The audience then broke up into 5 brainstorming groups where these ideas and others were discussed. Each group then made a brief presentation about their deliberations and some very interesting ideas were proposed. 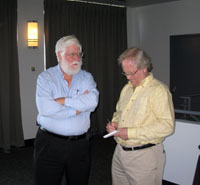 Dr. Peter Swan and Skip Penny are going to summarize these and post them on the ISEC website within 60 days. Of course I’ll have a post here on the blog about it. The day wound up with an Evening Mixer at the Museum of Flight’s Red Barn Gallery. It was a wonderful first day and everyone who attended thoroughly enjoyed it – more tomorrow! This entry was posted in ISEC, News / Announcements on August 23, 2013 by Ted Semon. The ISEC eNewsletter for July has just been released and is available here. All ISEC eNewsletters are available here. Stories include announcements about the upcoming Conference, the recently released CLIMB Volume 2 report and the IAA Space Elevator report, scheduled to be released in the near future. You can sign up for our eNewsletters at the ISEC Web site. This entry was posted in ISEC, News / Announcements on July 30, 2013 by Ted Semon. Volume 2 of CLIMB now available! 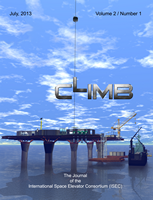 Volume 2 / Number 1 of CLIMB, the Space Elevator Journal, is now available in printed format! This issue contains some of the best, peer-reviewed Papers relating to a space elevator that have been written since Volume 1 was released in December of 2011. It also includes, as Volume 1 did, several Additional Reading articles which we at ISEC think will be of great interest to the Space Elevator enthusiast. Volume 1 of CLIMB was the “Yuri Artsutanov” issue and Volume 2 of CLIMB is the “Jerome Pearson” issue. 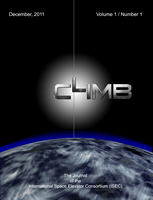 We have honored these engineers in the first two issues of CLIMB as they were the original inventors of the Space Elevator concept that is referenced today in all serious work on this subject. I’d like to also note that Jerome Pearson will be the Keynote speaker at this year’s Space Elevator Conference (you are coming, aren’t you?) and will be at the conference all 3 days. It will be a great opportunity for you to purchase a copy of CLIMB at the Conference (unless you have already received it as part of your membership benefits) and have Jerome autograph it for you. 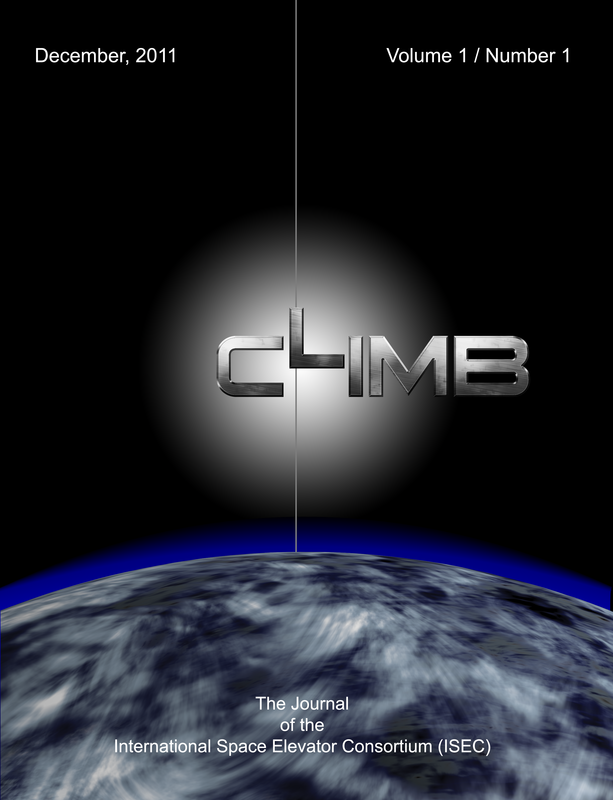 The plan is now to publish future issues of CLIMB each year in the June/July timeframe, this to be coordinated with the annual Space Elevator Conference. So, you can look forward to future issues of CLIMB each year. To purchase Volume 2 of CLIMB, or any other ISEC publication, visit the ISEC Store or our publisher, Lulu.com. This entry was posted in ISEC, News / Announcements on July 29, 2013 by Ted Semon. The Proceedings for last year’s Space Elevator Conference are now available at the ISEC Store. This was an excellent conference, with many strong presentations. If you attended the Conference, this CD will be mailed to you in the next several days. For those of you who may have missed the conference, the $20 purchase price for the CD is a bargain. Also available on the ISEC Store are the Conference proceedings for the 2008, 2009, 2010 and 2011 Space Elevator conferences as well as the Space Elevator Journal, CLIMB, the ISEC Reports and the ISEC Posters. This entry was posted in ISEC, News / Announcements on July 4, 2013 by Ted Semon. Just a reminder about ISEC’s unified social presence – and that is ISECdotORG! The (new)ISEC Facebook page is ISECdotORG! The ISEC Flickr Photostream is ISECdotORG! 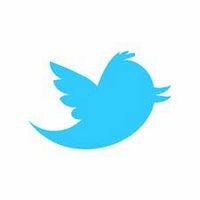 The ISEC Twitter Feed is ISECdotORG! And The ISEC YouTube channel is ISECdotORG! The old ISEC Facebook page, International Space Elevator Consortium, has been discontinued. So, Like, Follow and Watch ISEC at ISECdotORG! This entry was posted in ISEC, News / Announcements on July 1, 2013 by Ted Semon. 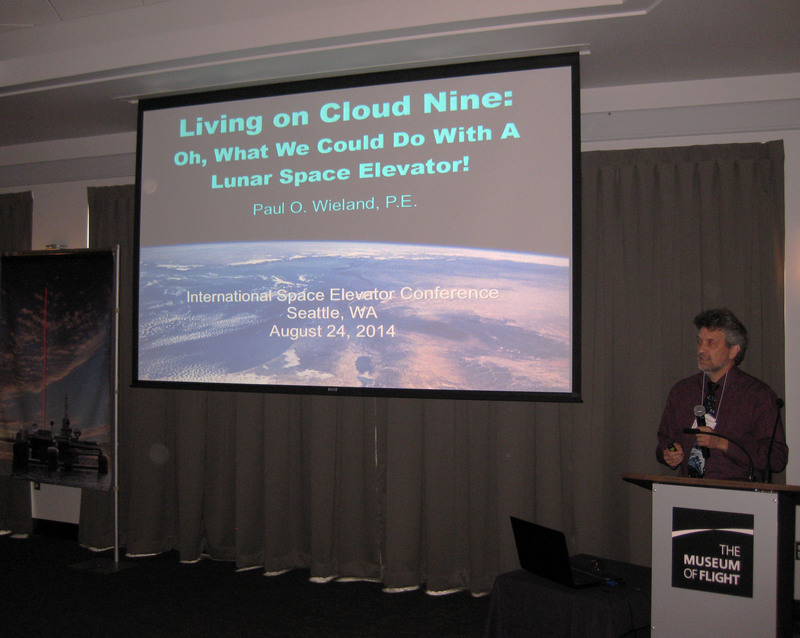 Reminder – Early Bird prices for the upcoming Space Elevator conference end Sunday! 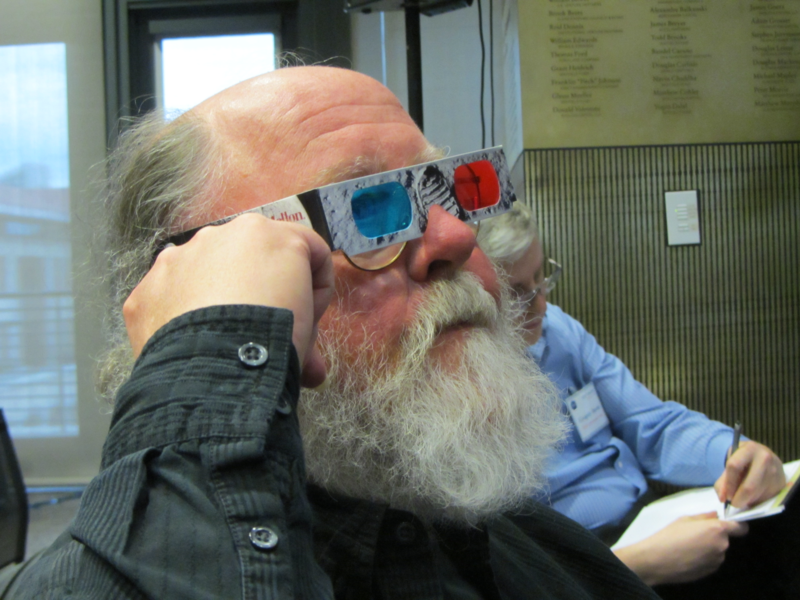 This conference, scheduled for August 23rd through the 25th, is talked about in more detail in a previous post on this blog and in the current ISEC eNewsletter. It’s going to be a GREAT conference and I hope to see all of you there! This entry was posted in ISEC, News / Announcements on June 27, 2013 by Ted Semon. The ISEC eNewsletter for June has just been released and is available here. 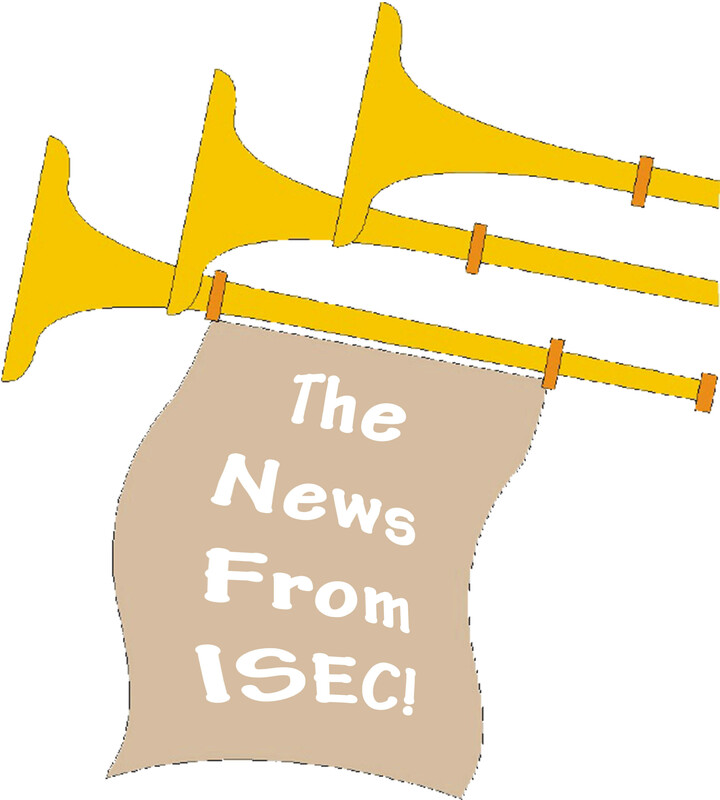 All ISEC eNewsletters are available here. Stories include announcements about the upcoming Conference, the recently released ISEC CONOPS report, results from a recent Climber competition in Japan and a description of our new Social Media presence. This entry was posted in ISEC, News / Announcements on June 10, 2013 by Ted Semon. 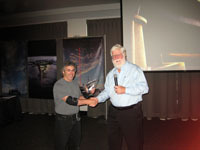 Tickets for the 2013 Space Elevator Conference now on sale! Tickets for the upcoming Space Elevator Conference are now on sale! Prices have been reduced from previous years and are a better bargain than ever. “Early Bird” prices are available through the end of June after which registration fees will revert to the full price. 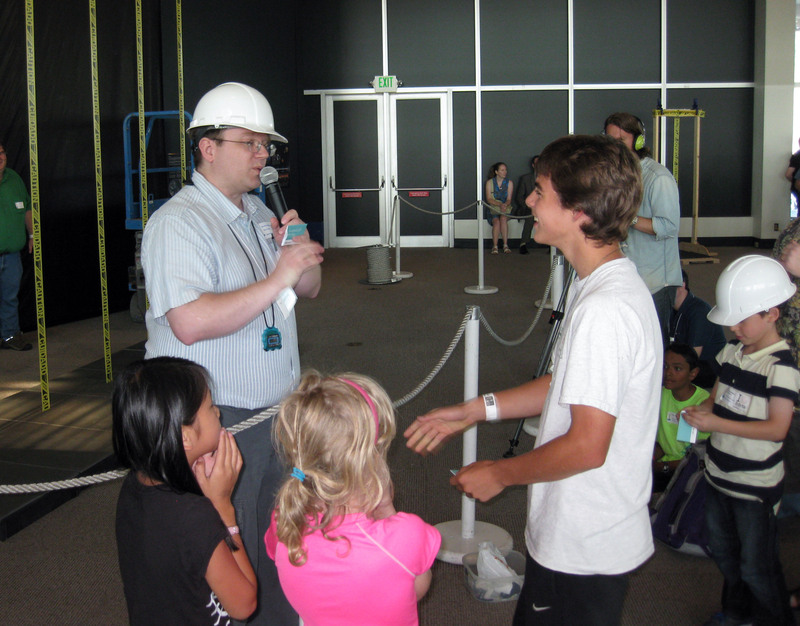 The conference, to be held on August 23rd through the 25th, will again be hosted at Seattle’s Museum of Flight. Last year was our first at this new venue and it was truly outstanding. 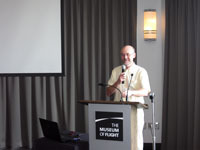 The seating arrangement (large, round tables) was much more conducive to conversation among the attendees and the ‘backdrop’ of the Museum of Flight has to be experienced to be believed. So, don’t wait – sign up now! We have a very full schedule including several presentations and a few workshops. And, as an added bonus, Jerome Pearson, the American Engineer who independently invented the idea of a tensile-based space elevator, will be the Keynote speaker!. This year’s version of CLIMB is the “Jerome Pearson” edition and if you bring your copy to the conference (or purchase a copy at the conference), I’m sure Jerome will be happy to autograph it for you. This entry was posted in ISEC, News / Announcements on June 7, 2013 by Ted Semon. The second in an ongoing series of ISEC reports has been released; Space Elevator Concept of Operations. This report was written by ISEC Board Members Skip Penny and Peter Swan and co-authored by Cathy Swan. 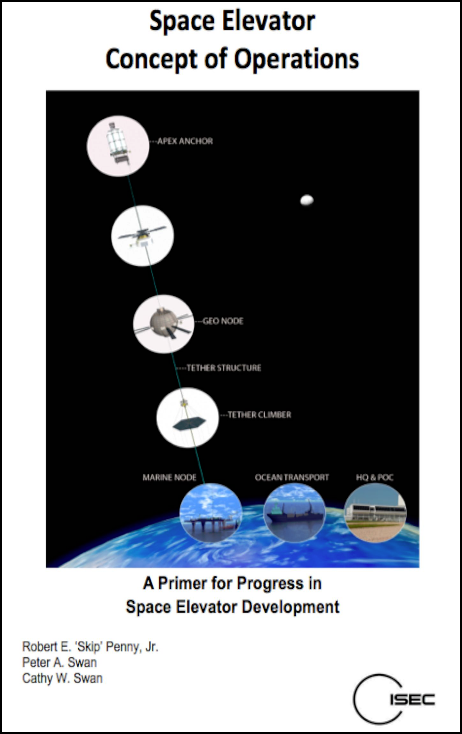 Other ISEC Board members made suggestions and critiques during the creation process and comments and suggestions were also made in a workshop at the 2012 Space Elevator Conference devoted to this report. Priced at only $7.00, this study is an important step in fulfilling an ongoing goal of ISEC: – taking away reasons why people can say “No” to the idea of a Space Elevator. The report is now available from the ISEC shop at Lulu.com and will also be available from the ISEC Store. (Click on the thumbnail picture of the cover to see a full-size image). This entry was posted in ISEC, News / Announcements on May 31, 2013 by Ted Semon. Now that ISEC has finally succeeded in publishing and releasing Volume 1 of CLIMB, the Space Elevator Journal, ISEC has now issued its official “Call for Papers” for Volume 2. Your article must have some relevance to the Space Elevator itself or to technologies that will be needed to build and operate a Space Elevator. Article submission deadline is May 15th (this year!) as we want to have this issue published in time for the 2012 Space Elevator Conference (tentatively scheduled for August of this year). We will soon have the format specifications ready. If you are interested in submitting an article, please send me, ted [AT] isec.info, an email letting me know. The first issue of CLIMB is something we’re very proud of and, with your help, we can make the second issue even better. We have again assembled a top-notch review team and we’re confident that the second issue of CLIMB will be as technically excellent as the first issue was. This entry was posted in ISEC, News / Announcements on February 15, 2012 by Ted Semon.